Our test agents run on AWS EC2 c4.large instances which gives you plenty of CPU horsepower and are a good approximation for everyday desktop browsers. But mobile devices are generally much slower than desktop, especially in developing countries where the next billion people will come online. So for our emulated mobile devices we throttle the CPU to better approximate the CPU available on actual devices. Our CPU throttle values are based on Geekbench scores for iOS and Android devices. We used a MacBook (Mid 2017) with a Geekbench single core score of 3607 as a baseline. Higher values are slower. A CPU throttle of 2 means half the CPU. If you want to change your CPU throttle or emulate any other older slower devices you can create a custom browser in your Settings. 1. Go to your Settings page and hit the green 'Edit Browsers' button. 2. Scroll down to the 'Custom Browser Profiles' section and click the link to add a custom profile. 3. 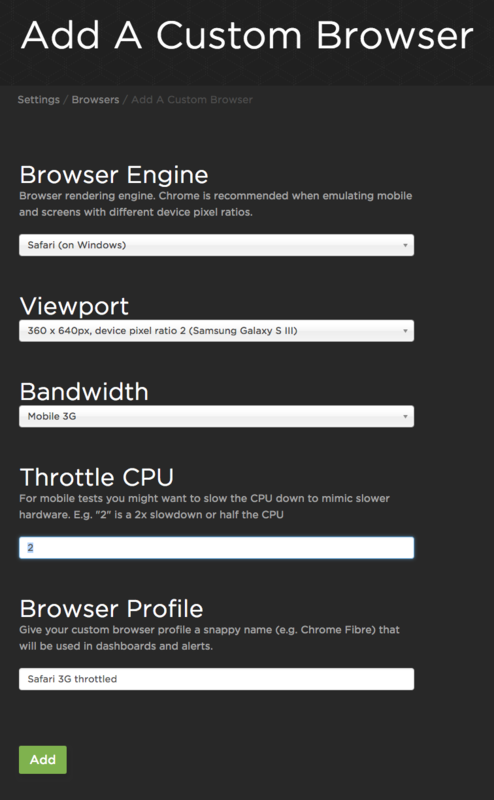 The 'Add a Custom Browser' page gives you a bunch of customization options, including 'Throttle CPU'. In the example below, we've created a 2X CPU slowdown for Safari over 3G. We've named this profile 'Safari 3G throttled'. 4. When you've created your custom browser profile, hit the green 'Add' button. This will take you back to your main Settings page, where you'll see your new custom profile grouped with your other browsers. This browser profile is now available for you to use in your Sites settings.